An excerpt from Welles’s Naboth’s Vineyard: The Dominican Republic, 1844-1924 (1928). Welles was the American commissioner who oversaw the United States occupation of the Dominican Republic in the 1920s. Later he became President Franklin D. Roosevelt’s Secretary of State. 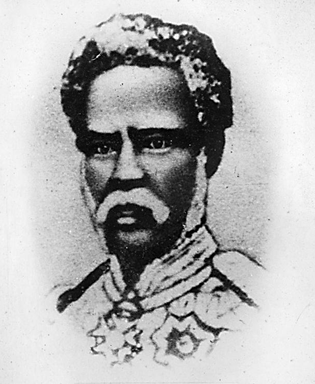 The death of Salnave [who was publically executed] and the increased stability which his removal from the scene gave to General Nissage Saget, who now proclaimed himself President of Haiti, made it evident that [Saget’s Dominican rival] Báez could look no longer for assistance in Haiti against the increasing activities of the Dominican revolutionaries in Haitian territory. Báez therefore directed a cry for the assistance to the Government in Washington. In response to his request, the American Government dispatched immediately to Dominican waters an additional number of warships and by the end of February, 1970, seven American vessels of war were cruising in Dominican or Haitian waters. As soon as Báez was reinforced by this unprecedented support rendered by the United States Navy, which not only succeeded in intimidating the Haitian Government but also prevented the outbreak of any sporadic acts of protest in Dominican ports, he proceeded to carry out the plebiscite to which he had in advance committed his country…. "to unite their destinies to the destinies of the great Republic of North America." 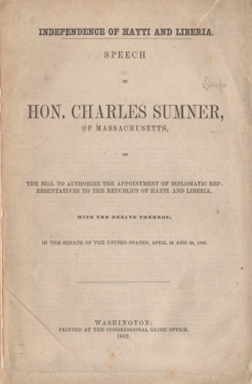 Thoroughly as the [Grant] Administration was committed to the proposed treaty, and notwithstanding the manner in which the President had identified his own political fortunes with its ratification, the great influence of Senator Charles Sumner, the Chairman of the Senate Committee on Foreign Relations, was thrown against it…. The result of his own investigations, and his peculiar knowledge of conditions in the Caribbean, had proved to his satisfaction that there existed no spontaneous desire for annexation on the part of the Dominican people themselves, and he had become assured that the stimulus behind the project, apart from Baez’s own ambitions, had been the machinations of the ever-increasing group of speculators and promoters headed by Cazneau and Fabens, with whose past careers Senator Sumner was fully acquainted. An even stronger motive for the opposition of Senator Sumner was the implied threat in the policy of the Executive that the annexation of the Dominican Republic would necessarily entail the eventual annexation of Haiti.